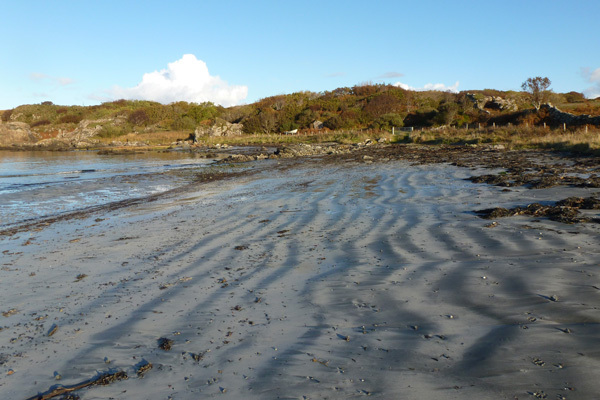 A short walk to Kilmory Beach on the Ardnamurchan peninsula, a lovely sheltered sandy beach on the north coast of the Ardnamurchan peninsula. The beach is punctuated by numerous rocky outcrops of heavily jointed igneous rocks, and fringed with green and purple hued boulders and shingle. The outcrops are coated with a variety of crustiose lichens. 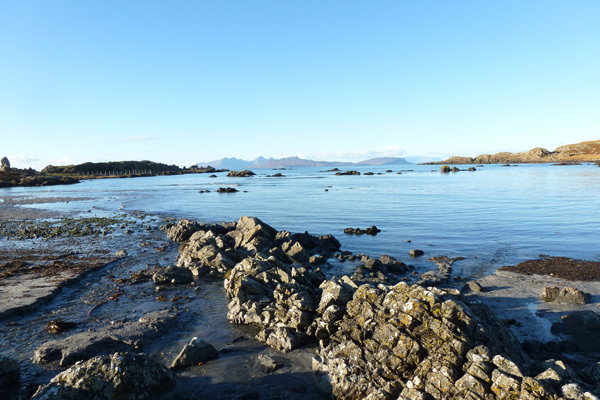 There are also some lovely small islets just off the coast. 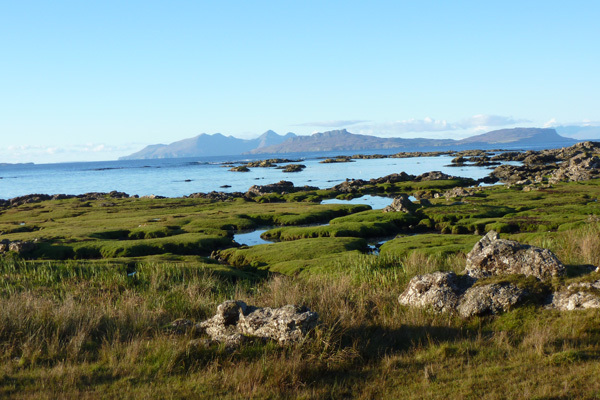 The bedrock is part of the Ardnamurchan Central Complex-Agglomerate (Palaeogene) overlaid with marine beach deposits from the Quaternary Period. 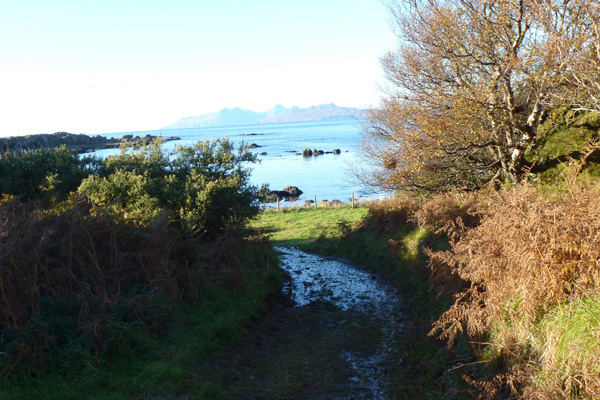 The route to the beach is along stony and grassy tracks; with the latter a little boggy in places. For most part, the track is fringed by oak, birch, ash, willow and hazel. It descends to the beach following a stream, often heard rather than seen. There are some lovely patches of yellow flag iris and meadowsweet assemblages near the beach. At the far end of the beach, there is a standing stone encrusted with fructose and crustiose lichens, polypody (Polypodium vulgare), heather (Calluna vulgaris) and stonecrop (Sedum spp); the species composition dependent on aspect and micro-topography. 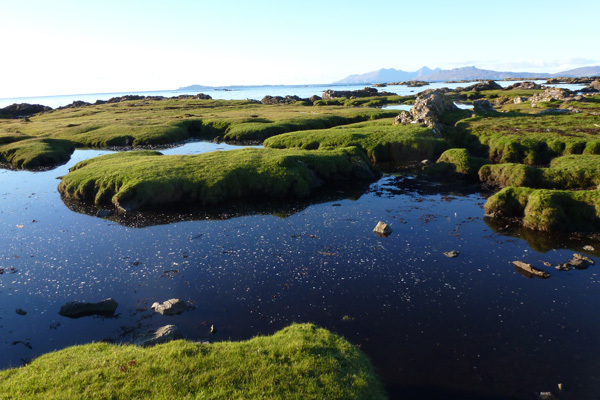 There is also a lovely area of wet meadow, studded with rocky outcrops, and salt marsh with its dendritic channels, mini-islands and pools. The salt marsh is awash with colour in Spring. 1. 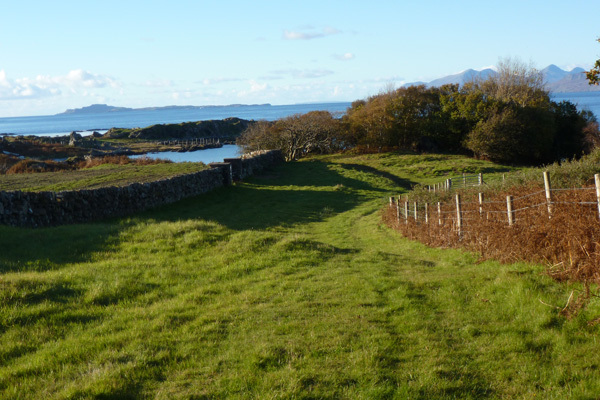 Park by the road side in the village of Kilmory on the Ardnamurchan peninsula and take the footpath signposted to the beach adjacent to some outbuildings. The route is initially along a stony track. 2. Pass through a metal gate by the stream and then veer right as directed onto a broad grassy track. 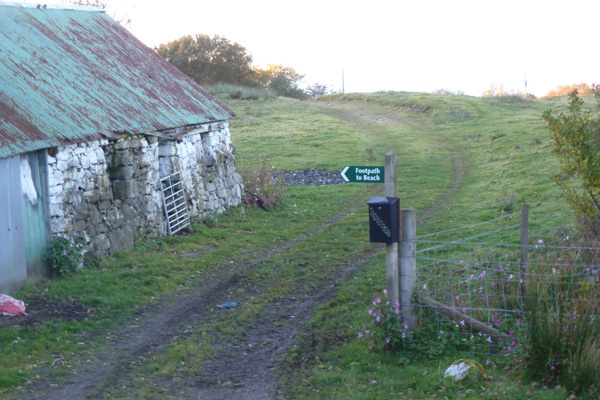 The track passes by a small cottage on the left and is fringed with oak, birch, hazel and ash trees on the right. The track follows a stream before veering left towards the beach. The beach is entered through a metal gate. 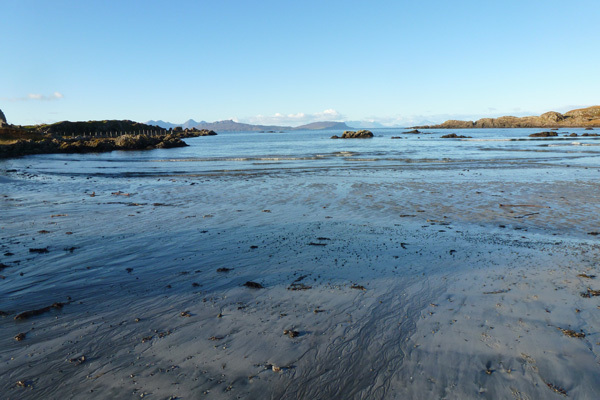 Take time to enjoy this lovely sandy beach, which is particularly lovely and expansive at low tide. You can also head across to the far end (west side) of the beach, where there is a standing stone, accessed by a narrow footpath. 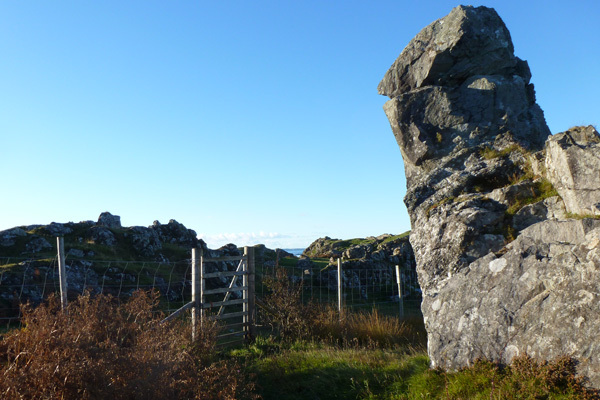 You can also make you way through the gate behind the standing stone to access an area of wet meadow and salt marsh. Take care when walking across the salt marsh as the channels can be deep. The salt marsh merges in a shingle beach, with its fucoid assemblages. 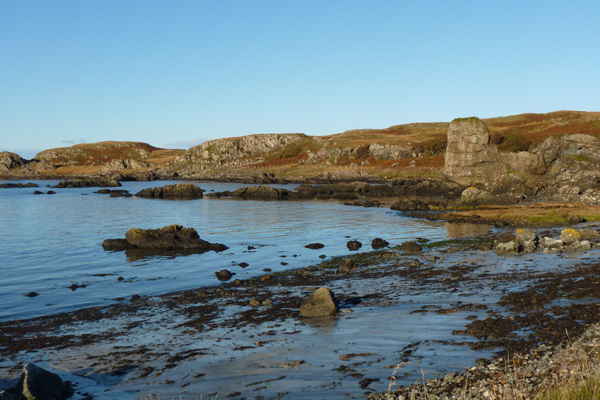 You also across the headland to the beaches of Port Ban and Achateny, although this will involve some scrambling and is best done at low tide. 3. Return by the same route.